Novak Djokivic, Serbian Tennis player born in 1987, started playing tennis at the age of 4, in 2001 at the age of 14 he began his international career. 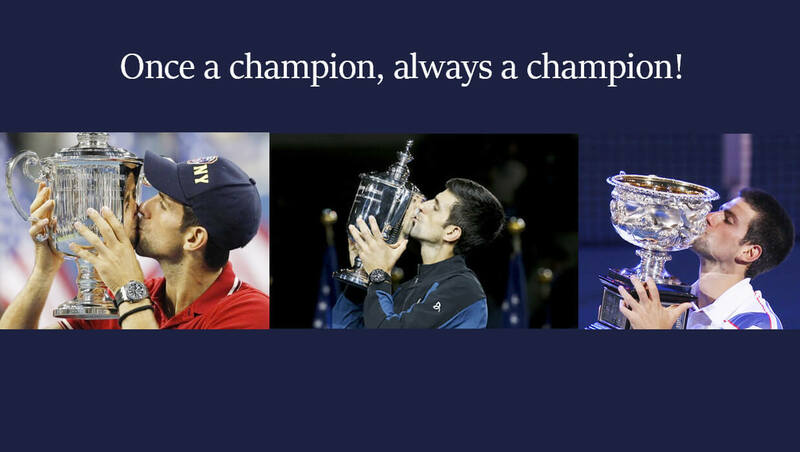 After seven years of practise and drudgery, he won his first of many grand slam title in 2008. He became the eight player to achieve Career Grand Slam, from there many more feats to adorn his win list; 14 grand slam single titles, five ATP final titles, six Australian Open, four Wimbledon and three US Open titles…( phew...its endless, I know).He is the first and only male player to have won all nine of the masters 1000 tournaments on the ATP tour. The Serb champion added another golden feather in his cap, his third US Open title and 14th grand slam title with a 6-3 7-6 6-3 victory over Juan Martin. The best part of the victory is that now, Djokovic equal’s tennis legend Pete Sampras grand slam title haul ,leaving only behind his major rivals Nadal and Federer ; the rankings falls as the most grand slam titles(ATP) ; Federer holds first position with 20 and Nadal holds 17. Right after the match, Djokovic credited his success to rivals Rafael Nadal and Roger Federer for making him ‘the player he is’ now.